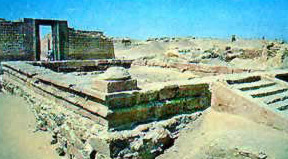 Located at Fayoum (Fayium) and founded during the reign of Ptolemy II in the 3rd century BC, Karanis was built around a temple to the god Petesuchos, a crocodile god. As the town prospered and grew another temple was built to the north for the god Sobek. The south temple has three rooms that are linked by a wide vestibule. The main doorway bears an inscription of the original dedicatee, Nero, which was later altered to that of his uncle, Claudius. A large altar in the sanctuary contains a large hole to hide a priest acting as an oracle, which was common in many temples.. Steam rooms and pools of the Roman baths can still be seen in the north temple, which is now mostly ruin. Many everyday well-preserved objects and papyrus can be seen in the nearby museum.